Hardware design engineers are forever looking for new solutions for their design tasks. But they are also under time constraints to solve all of the challenges of a new project: always smaller, always more functionality, always lower cost, and with a reliable, well-engineered and tested board. More and more supply rails are required for power supplies in industrial programmable logic controller (PLC) systems with central processing units, input/output and communication modules, or human machine interface (HMI) panels. Board space is running out quickly. Small-outline transistor SOT23 is a common package type for DC/DC converters in such applications; however, it consumes a relatively large amount of area on the board. With more than 8 mm2 of package and inductors at 4 mm by 4 mm or larger, the available board space in an industrial system is limiting the number of power rails that you can implement. Moving to an ultra-fine-pitch ball-grid array or chip-scale package is often cost-prohibitive in mass production, and comes with soldering and bench-testing challenges. SOT563 combines the advantages of a leaded package with a very small size (Figure 1). It is not a new package for semiconductors. Available for several years for discrete components like metal-oxide semiconductor field-effect transistors, diodes or temperature sensors, it is now also available for DC/DC converters. The SOT563 package is 65% smaller than the ubiquitous SOT23 while still offering leads (pins) accessible to a probe (tester). In addition, these leads enable the use of low-cost mass-production facilities with visual inspection instead of the more complex X-ray checking of the soldering. The SOT563 package’s small solution size makes it a good fit for multirail power supplies in HMI or PLC systems. You can place the voltage rails onto the board where they are needed, close to the loads for best performance and maximum flexibility. Instead of a single large power-management integrated circuit, a multiple-rail approach can simplify the board layout to a great extent and help optimize your system’s electromagnetic interference performance. The 12-mm-by-12-mm, 5-Rail Power Sequencing for Application Processors Reference Design, featuring the AM3358 Arm® Cortex® microcontroller, is an example of such an approach (Figure 2). As the title indicates, the total power solution size for the reference design’s five rails, including all required external components like inductors, capacitors and resistors, is just 12 mm by 12 mm. 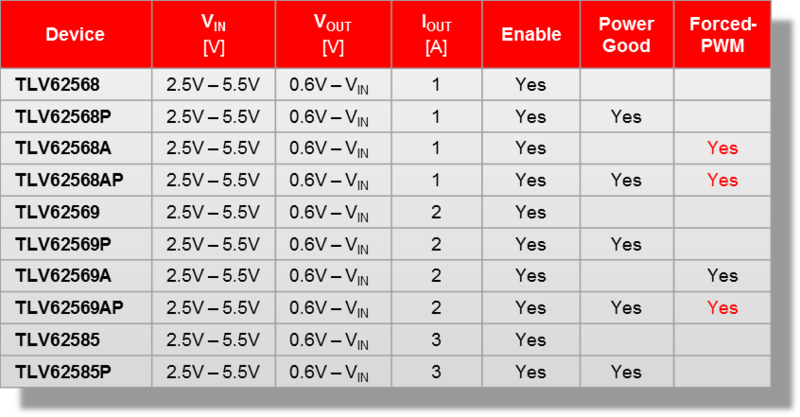 The power consumption of PLC modules is relatively low, typically not exceeding 2 W per module; most power-supply rails are therefore only up to 1 A, 2 A or 3 A. However, thermal constraints often prevent the use of linear regulators and therefore require a high-efficiency DC/DC converter for the point of load, like the new pin-compatible TLV62568/TLV62569/TLV62585 family (Table 1). The SOT563 package for DC/DC converters offers many advantages in terms of solution size and ease of use. It is quickly becoming the new standard package for many industrial applications, including those with HMIs and PLCs.